MSD delivers a range of high-performance ignition coils made for an array of applications. 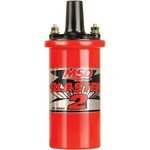 From OEM replacement models, to Blaster 2 coil kits that boost spark output on stock systems through the HVC II Coil, MSD offers a coil for just about any application! MSD manually assembles a number of the high-output racing coils entirely in-house. MSD’s engineers thus have greater control over the quality, output, and, ultimately, the performance that you get out of the ignition system. HVC II Coils are built entirely in-house and are designed with cutting-edge Rynite molded bobbins and unique wiring for the windings. This cutting-edge technology might be overkill for a lot of applications, but what we learn from making these race coils is applied to the development of all MSD coils and other products.